Whenever I drop in to see some of my old friends, it’s almost inevitable that there would be some computer problems that need solving. This time around it was no exception. With this being the season for new researchers starting up at the department, there are always going to be bring-your-own-device hassles. In this case, a researcher had an Apple Macbook of some description. The researcher did not have Wi-Fi credentials issued yet, so connection via Ethernet is the preferred option. Unfortunately, the Macbook has no Ethernet port, thus necessitating the use of a USB to Ethernet adapter. The issue was initially discovered when the researcher wanted to set-up the network printer only to find the test page would not print. 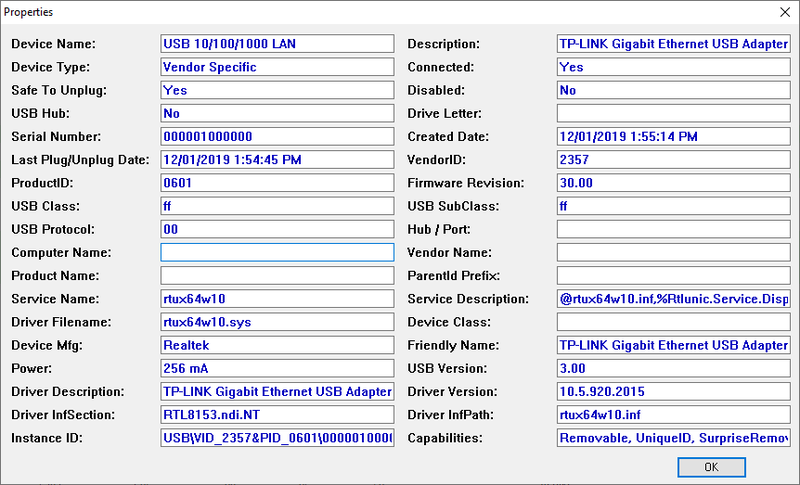 The adapter in question is a TP-Link UE300 V1.0. The adapter has a glossy white plastic finish with rounded corners, silver branding and a small transparent pinhole for the activity/link LED. The cable wraps around the casing when in its storage configuration. 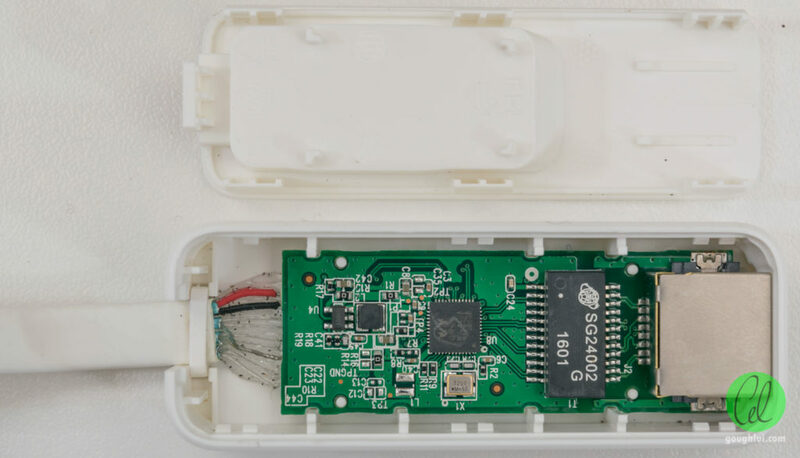 The underside of the adapter features a cut-out to allow for the USB plug to comfortably nestle into the adapter for easy storage and transport. The product information label is affixed to the bottom of this cut-out. The port for the Ethernet cable is at the opposing end. Not being familiar with Mac OSX, I noticed that their attempt to install the printer resulted in “Invalid Address” or something to that effect appearing underneath the IP address we input. This immediately suggested to me that there was a network connectivity issue. Calling up System Preferences -> Network, due to the way the drivers for the interfaces work in Mac OSX, the network controller remains in the list regardless of whether the device is plugged in or not. 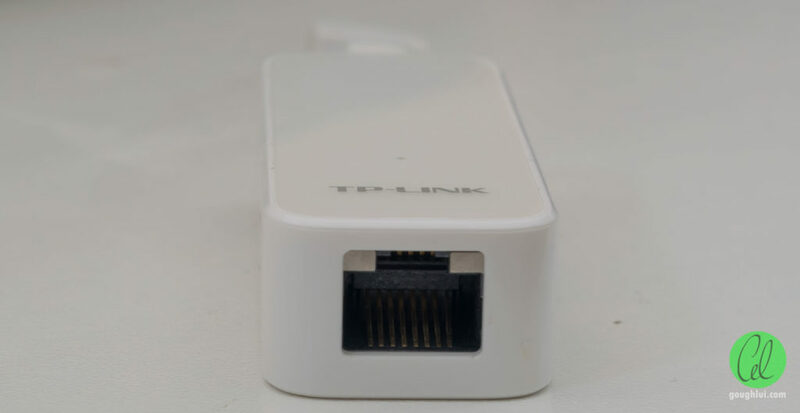 When plugged in, the listing in Network maintains “Cable Unplugged”, but it is clear that Ethernet link is established to the router. 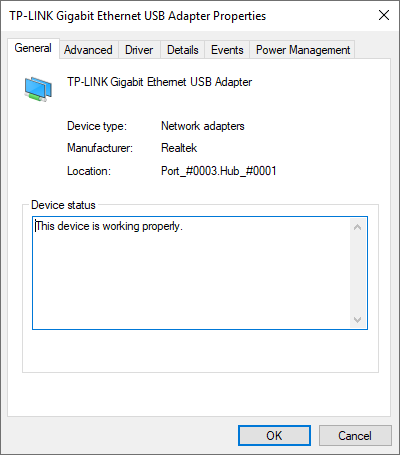 I immediately diagnosed the printing issue as a fault with the USB Ethernet adapter, narrowing the issue down to the USB link to the Ethernet adapter. We firmed the hypothesis by immediately exchanging the adapter for a known working one and printing was successfully achieved. Delving further, using System Information, it was clear that the adapter was not registering on the USB bus. This suggested a possible failure in the controller or a cable break. I thought maybe a surge or ESD could have damaged the unit, but then remembered the cable length was relatively limited. I then surmised that it may have been a fault in a USB 3.0 differential pair, but no damage to the connector was identified. It was then found that plugging in the USB port only part-way, so that only the USB 2.0 connection is made and the USB 3.0 pair remains unconnected, allowed for the adapter to function and attach to the High Speed (not SuperSpeed) bus. As a result, the controller was probably okay. So I was pretty sure it was a broken USB 3.0 differential pair connection, but instead of gracefully falling-back to USB 2.0 rates, Mac OSX seems to continue to attempt connecting at SuperSpeed rates unsuccessfully. As a result, I was given approval to take the unit into my custody for a teardown and repair. The unit uses a screwless design, being held together by catches on all sides. The unit is based around a single-chip design, using a Realtek RTL8153. Aside from that, the PCB houses a voltage regulator, crystal, magnetics and the port itself. The cable comes in on the edge and is “retained” weakly by a grommet. To keep the wires from being too stressed, a weak silicone is spread all over the wires. An unidentified foreign substance seems to have contaminated the silicone causing a black speckly appearance. It was not easy to extract the wires from the silicone without breaking them further. However, it was already determined that one of the wires may have already snapped due to external applied stress or due to damage to conductors during stripping. Regardless, this arrangement is very “low-cost” and the design doesn’t seem to be highly durable. It is also disappointing to see some EMI control ferrite beads have also been omitted on the PCB. On this side, there is a Winbond 25Q16DVSIG 16Mbit Flash chip. The PCB is marked 2001500236 20558 dated Week 13 of 2016. As I had over-stripped the USB lead, to protect it when it goes through the case, I slipped some yellow heatshrink over the lot and then filled the area with hot glue, heating it to reflow it so as to hopefully “flood” the area and maintain the connection. … it does work on my home PC. By downloading USBDeview, it seems that it was possible to have it connect both in USB 3.0 and 2.0 mode depending on which ports I connect to. When it comes to troubleshooting, it pays to check that your car has tyres and they’re inflated before you complain that you can’t drive down the freeway at 100km/h. In this case, what manifested itself as a printing problem was actually a network problem, but was easily missed as the physical link was maintained and the link lights suggested a connection was made. Because of the behaviour of Mac OSX, the network adapter appears in the list even when unplugged, so a lack of USB detection is not made clear unless you examine System Info under USB. It also seems that the OS does not gracefully fall back to USB 2.0 in case of USB 3.0 communication issues, so plugging in the USB port only just far enough to allow USB 2.0 pins to touch while the USB 3.0 pins remain disconnected did allow the laptop to operate the adapter at reduced USB 2.0 rates. Regardless, the problem boils down to some rather poor design with weak/flexible silicone and limited cable retention failing to mitigate stress on the point where the thin wires met the PCB. Ideally, crimped/socketed connections or a proper moulded strain-relief would make for a more durable design, but with the cost-sensitive consumer electronics market, it seems that such compromised designs are still sufficiently robust to sell with potential for “repeat sales” when it eventually fails. This entry was posted in Computing, Electronics and tagged computer hardware, networking, repair, teardown, troubleshooting, usb. Bookmark the permalink. TPLink are bottom of the barrel in my books. I bought an (relatively) expensive router of theirs a few years ago only to be faced by no firmware updates when a wifi exploit was found. The model in question was still being sold, as version 4, while I owned the version 1 …..